Terms of Service – Walnut Tech. All information and materials on the website are presented for the purpose of providing information on our products and services we provide. The website may contain information on our worldwide products and services, not all of which are available at every location. A reference to our products or service does not imply that product or service is or will be available at your location. Please be aware that whenever you post comments on our website that the information may be accessible for other users. WALNUTT does not claim any ownership rights in the text, files, images or any other material that you may post on the website. After posting your user content on our website, you hereby grant us a license to use your content on and through the website or a third-party platform until you remove your user content form the website. The website offers the possibility for users to create a personal account by providing certain information. In such case, you will be required to choose an email address and password. You are entirely responsible for maintaining the confidentiality of your password. You are solely responsible for all use of your account. You are prohibited from posting or transmitting any unlawful, threatening, obscene,Scandalous, libelous material or any material that would be considered as a criminal offence, give rise to civil liability or otherwise violate any law. WALNUTT reserves the right to remove any information or materials posted or transmitted by anyone which breaks these rules. You are granted a limited license to access and use the website and the website content and to download or print a copy of any portion of the website content to which you have properly gained access solely for your personal use, non-commercial use. While WALNUTT endeavors that the website is normally 24 hours a day, it will not be liable if for any reason it is unavailable at any time or for any period. Access to the website may be suspended temporarily and without notice in case of a system failure, maintenance or repair or for reasons beyond control. For those individuals who visit our site but do not make a purchase, we collect and store IP ("Internet Protocol") addresses during the visit. No individualized information is collected, and the IP address is not traced to a particular individual. Similarly, we collect information, using that IP address, about the navigational or browsing activities of our visitors. Again, that information is not tied to any name or other personally identifying information but is used solely to provide demographic data, such as what geographic areas our visitors are from and visitor browsing patterns. For those who make a purchase on store.walnutt.com, in order to fulfill the order, we collect and store your name, address, shipping information, e-mail address, telephone number, purchase data, and billing information. We will use the information referenced above to fulfill your order and provide services related to store.walnutt.com. Examples of these services include payment processing and authorization, fraud protection and credit risk reduction, product customization, order fulfillment and shipping. In addition to using the information referenced above to fulfill your purchase order, we also retain some of that information in our customer database. We use that information to track your order, to respond to your inquiries and to make subsequent purchases you wish to make easier and faster. We also may use that information, to contact you concerning our products, services, sales or special promotions. We currently send e-mails only to those customers who subscribed our email or placed order on our website. If you have previously received such e-mails, but no longer want to, contact us by the email referenced above. Walnut Technology Limited (WALNUTT) After-sales policies only apply to all WALNUTT products unless there are other policies from a third-party distributor or a retailer for orders placed on its own platform. The WALNUTT After-sales Policies only apply to the products purchased for the customer’s own use and not for resale when an original copy of receipt is provided and all altered identification labels remain unchanged and undamaged. 1.1. Within 7 days of purchase, the customer may cancel the order without any additional charge or obligation. 1.3. Once the product has been shipped, and the status of the order is “Shipping”, no refund will be permitted. 1.4. After the product has been delivered, the return policy applies. 1.5. We will proceed the customer’s refund within 14 working days by PayPal or any third-party platform. The customer is obligated to any fee charged by PayPal or any third-party platform. * Within 7 days of purchase, if the status of the order is “Processing”, a 15% cancellation fee will be charged when the customer cancels the order. Return Policies only apply to the period of 14 days after the product is successfully delivered to the customer. Please noted Customers will only be charged once at most for shipping costs (this includes returns); No-restocking to be charged to the consumers for the return of the product. 2.1. 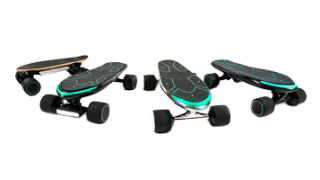 As all the SPECTRA skateboards are customized products, WALNUTT will not proceed return or refund except for units with manufacturing defect. 2.2. Malfunctions caused by manufacturing issues, WALNUTT will be responsible for replace or repair and shipment for both sides. The return of a product is only allowed within 14 days after the product is successfully delivered. 2.3. If the customer would like to return a product to WALNUTT when there is manufacturing issue or any malfunction on any parts of the board, the customer needs to send the board to a licensed local distributor or any location required by WALNUTT. Once the returned product is delivered to a local distributor or WALNUTT, WALNUTT will proceed the customer’s refund within 14 working days by PayPal or any third-party platform. The customer is obligated to any fee charged by PayPal or any third-party platform. 2.4. If the returned product is broken or not fully functional, WALNUTT will NOT proceed any refund. In this case, the customer can request a repair based on the WALNUTT LIMITED WARRANTY POLICIES. 2.5. If the returned product is broken or not fully functional, the customer needs to pay the shipment fee sending to a licensed local distributor or any location required by WALNUTT and WALNUTT will NOT proceed any refund. In this case, the customer can request a repair based on the WALNUTT LIMITED WARRANTY POLICIES. 3.1. WALNUTT warrants that its products will be free of manufacturing and/or workmanship defects for a period of 6 months, starting from the date when the customer received the product under a proper usage. 3.2. WALNUTT will examine the returned product to identify the problem. If WALNUTT determines that the issue is not covered by WALNUTT Limited Warranty Policies, the customer can request a Customer Paid Repair Service. The customer needs to pay the shipment fee sending to a licensed local distributor or any location required by WALNUTT. Parts such as bearings, hub motors, tires, trucks, the charging port, LEDs, carbon fiber cases, the MagBrake module (only in SPECTRA Pro), switch buttons, the battery module, and etc. are considered as consumables, and are therefore not covered under this warranty. • Failures of, or damages caused by, any third-party product. 3.4. WALNUTT does not offer International Warranty Services. Customers can obtain warranty services and repair services only at a designated repair center in the region where customer purchased the product or any location approved by WALNUTT. However, depending on parts availability, customers can obtain cross-regional repair services at an additional charge. In the region where does not designated a repair center, customers are responsible for shipping costs and potential tax fee during the product repair. 3.5. All repaired products are covered by the standard warranty starting on the date of original period. Canada and Mexico: $35 - Lite Shipment & $75 – Heavy Shipment fare applies for FedEx International Ground Shipping. Taiwan, Australia, Japan, Korea, European-Countries: $35 – Lite Shipment & $75 – Heavy Shipment fare applies. Mainland China, HK, Macau: Free Ground Shipping Service. Shipment will be made within 7 days upon the order confirmation,3-5 weeks for transportation and customer clearance.